As it’s the start of a new week, let’s begin with the usd to cad weekly chart and see what conclusions we can draw from looking at a longer time frame, and remember to use the long timescales for your direction, and the shorter time frames for your entry and exit points. In virtually all our trading we are either looking for confirmation signals of a move, or alternatively we are looking for turning points which may be signaling a change in direction. If we consider the weekly chart for a moment, some of the key points are as follows. First note the bullish engulfing candle of the first week in October, which also signaled the breakout for the usd to cad pair from the previous long period of sideways consolidation. The next point to note is the resistance level at 1.30, which has now been created by three failed attempts at a move higher. Finally, last week we have an extremely interesting candle pattern when combined with the previous week known as a Harami pattern. The “Harami” is an old Japanese word for pregnant, and hence describes the formation, where one candle is contained within another. In addition in this case the candle contained is also a shooting star, adding weight to the pattern. The Harami is the first signal that the market is losing its breath, in other words it is running out of steam. We therefore have a clear signal that the market may be turning, ( combined with the resistance area already created ) which might be confirmed by next week’s candle. Now let’s look at the daily chart. The USD/CAD currency pair fell sharply on Friday, partly as a result of volatility in the oil markets, with West Texas Intermediate daily oil prices closing above the 14 day moving average.For the last few years there has been a very close ( but inverse ) correlation between oil prices and the usd to cad currency pair. As oil prices rise, so the usd to cad falls, making the long USD/CAD trade a good hedge to changes in oil prices. Since the start of 2004, the correlation has been averaging around -84% which provides a good basis for correlation. As with the US dollar and oil prices, this correlation is not perfect, and does change over time, so whilst it is a useful tool, it is not a guarantee. As with many other Central Banks around the world, the Bank of Canada slashed its key interest rates last week to the lowest level in history, on the back of recessionary data, cutting the trend setting overnight rate by 0.5% to just 1%, just below the previous all time low of 1.12% which was set in 1958. At the same time the Bank issued a gloomy outlook for the economy for the remainder of the year. The cut was in line with analysts expectations who had been calling for bold action by both central government and the federal government. Since mid October, the USD/CAD currency pair have formed a significant resistance level at 1.2950, with the pair having made three failed attempts to breach this region. The first of these was at the end of October, which was reversed following a siginficant bearish engulfing candle on the daily chart. The reverse came several days later, and signifcantly with no breaching of the 40 day moving average, with a second attempt towards the end of November. A third attempt was made in early December, which failed following a significant doji upthrust, indicating weakness in the market, which was duly confirmed. 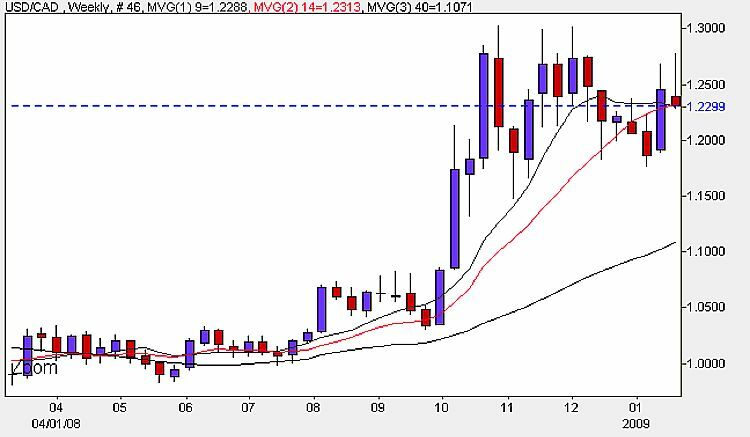 A final attempt last week failed at a lower level of 1.2750.On Friday prices touched the 40 day moving average, and have since penetrated this level in trading this morning, signalling the possibility of a move lower. Whilst this is not a signal in itself, if this holds then we could expect prices to fall further. The 9 day and 14 day moving averages have also crossed and are starting to turn. 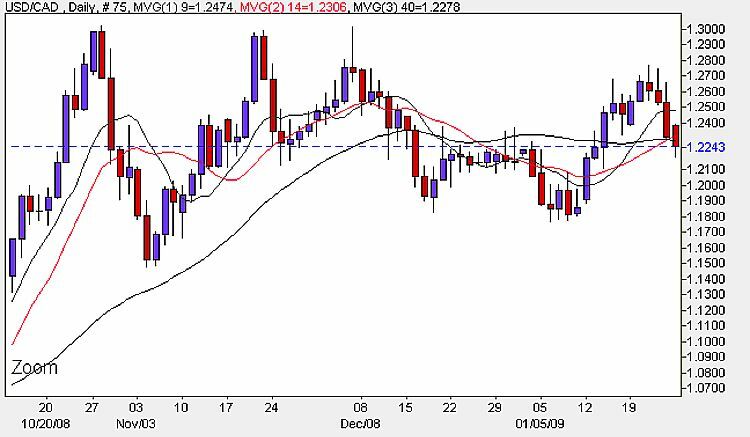 For prices to fall further the currency pair will need to breach the next level of support in the 1.2200 region.